Fruity Quinoa Oat Bowls is a plant-based recipe that is simple to make with only six main ingredients but one that is still filling and tasty. Depending on the weather and individual taste preferences, you can choose to enjoy these breakfast bowls hot or cold. This sweet tasting vegan, dairy-free, egg-free, oil-free and gluten-free recipe (can be nut-free too) is a delightful plant-powered boost to get you going in the mornings, especially if you throw in other additions on top! The best thing I like about this recipe is that it utilizes large quantities of a fortified plant-based milk, which helps yourself or family members get in a good dose of a calcium and vitamin D rich source, along with the nutrients from quinoa and other ingredients. Serve your child this Fruity Quinoa Oat Bowl alongside a glass of fortified plant-based milk and your child would have gotten at least 2 cups already of a good calcium and vitamin D rich source (know that some fortified plant-based milks are also fortified with vitamin B-12 as well)! If you plan to batch cook this dish, you can enjoy the extras hot or cold later in the week. In fact, I have found that having the made quinoa oat porridge sit in the refrigerator for a day or two actually causes the porridge to develop a nice creamy texture as it sits, almost like a tapioca pudding. Add a bit of fortified plant-based milk to the hot or cold porridge to thin it up if you would like a thinner consistency before consuming. Then pile on the chopped fresh fruits, nuts and other toppings as you like before enjoying! This delicious and filling sweet vegan, egg-free, dairy-free, oil-free and gluten-free quick morning breakfast can be enjoyed either hot or cold. Pile on the toppings! Use a fine mesh sieve to quickly rinse the measured amount of quinoa under cold running tap water. Transfer this rinsed quinoa into a small pot (I just usually turn the sieve upside down and give it a good shake or two over the pot). Into this pot, add the oats, cinnamon, raisins and the 2 cups of a fortified plant-based milk. Stir until well combined, then place into the refrigerator to sit overnight. Next morning, remove the pot from the refrigerator, and stir the contents a few times to make it well combined again. Then heat it unlidded on the stovetop on a medium setting until a gentle simmering is attained. Cook the pot contents with a gentle simmering boil for 10 minutes, stirring occasionally. Meanwhile, cut up a ripe pear into diced sized pieces. After this time, stir in the remaining 1/4 cup (60 mL) of a cold fortified plant-based milk. As the contents cool down, the pot contents will begin to thicken up nicely. Add the diced pear pieces to the pot, and stir to mix the pieces in. Taste and adjust seasonings as desired (or add further toppings). Ready to serve! Add more fortified plant-based milk if you would like your final quinoa oats porridge to be of a thinner consistency. I use a small pot because the next morning I can heat the pot directly once I remove it from the fridge. However, you can just use a suitable lidded container if you have limited refrigerator space. The quinoa oats porridge will continue to thicken over time as it cools and if it is placed into the fridge. If you would like this bowl of quinoa oats to be sweeter tasting, add in 1-2 chopped dates or another tablespoon of raisins. Alternatively, you could just add in more ripened cut fresh fruits, frozen berries or even chopped dried fruits into the bowl. Other great mix-ins to this breakfast bowl would be ground flaxseed, a dollop of a nut or seed butter, chia seeds, pumpkin seeds or chopped nuts like almonds, cashews or walnuts, or even some applesauce. Feel free to also add in other spices such as a dash of nutmeg, cloves, ginger, turmeric or allspice. Make sure to choose certified gluten-free oats to use in this recipe if you are on a gluten-free diet. Adding in the quarter cup (60 mL) of a fortified plant-based milk at the end of the cooking process helps to add to the creamy texture of the Fruity Quinoa Oat Bowl and also speeds up the cooling process. My children had varying responses to this morning breakfast meal because of the unique texture of quinoa. My 2 year old toddler loved it immediately (even the version that was fully quinoa that only had raisins and didn’t have any oats or pears added! ), but my five year old (who has had quinoa only in savory dishes before) took 3 tries before she accepted it into the weekly breakfast rotation. It turned out that my eldest actually liked this Fruity Quinoa Oat Bowl cold (it has a creamy tapioca-like pudding texture) and she loved the addition of the ripened sweet pear cubes mixed into the cooked quinoa oats. However, this dish also works very well if other types of fresh fruits are used, such as a soft ripe banana (this can be mashed or cut up into small pieces), ripened diced peaches or cut ripened mango cubes. If you decide to freeze some of this quinoa oats porridge, it is best to freeze a portion without the fresh fruits added. 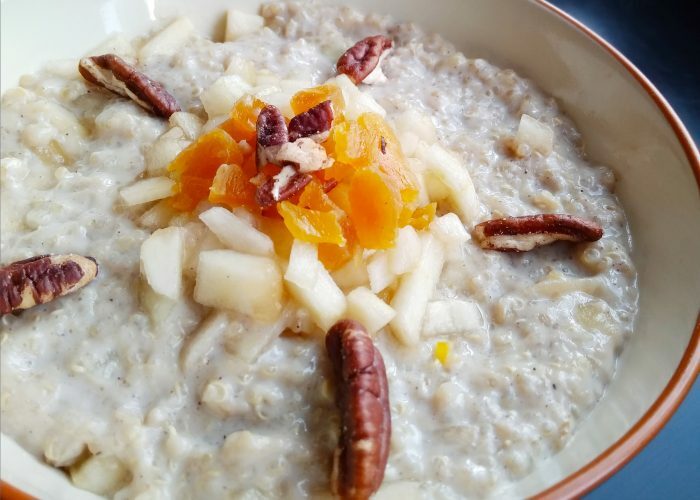 Upon thawing, it also works best to heat up the quinoa oats porridge to enjoy it as a hot breakfast (with fresh fruit added) as the texture is affected slightly upon thawing and is not as appetizing eaten cold. Wonderful recipe ! Great idea to use oats & quinoa in here. Thank you Nisha for your kind nomination – I am very touched! !